Movie Review - Monsters University — Always Packed for Adventure! Monsters Inc. is one of my favorite Pixar films, so I was thrilled to hear that a prequel was in the works. Monsters University is the story of how the two protagonist, Mike Wazowski and James P. Sullivan (Sully) met and became friends. Monsters University is filled with creativity, endearing characters and great writing. The story is very clever in the way that it tells the origins of both the friendship and the way that the two main characters became professional scarers. It's very funny. My boyfriend made a point to mention that he thought I was laughing more than anyone else in the theater. As much as kids will probably enjoy this movie, there are so many little details thrown in for adults. The movie has a lot of nods to the University experience and anyone who has gone off to higher education will get a kick out of the monsterfied- campus and student stereotypes. The story even has several strong moral messages regarding working hard, following your dreams, supporting your friends and that it's okay to be yourself. The message is not doled out in a cliche or treacly manner. The movie manages to be sentimental and sweet without being trite. Plot aside, this is really a character driven movie. Mike and Sully are two power-house personalities and the writers did a great job at having them naturally react to their circumstances to propel the plot. The movie introduces a lot of great minor characters. I loved the motley crew of Mike and Sully's fraternity, Oozma Kappa. They are a quirky bunch of guys. The Dean of Students, Abigail Hardscrabble was creepy and intimidating. If any character in the movie is going to frighten young children, it will be Hardscrabble. 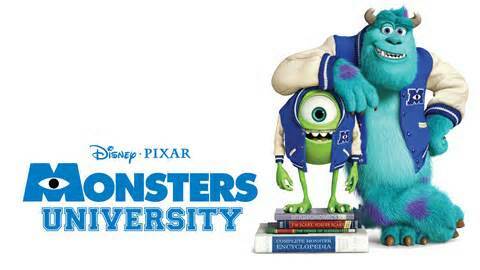 Monsters University is a thoroughly entertaining movie that all ages will enjoy. As much as I enjoyed the main feature, I was left underwhelmed by the Pixar short, The Blue Umbrella. I felt like the plot was way too similar to the recent Pixar short, Paperman, both stories involving a fate driven romantic encounter and crazy wind. I loved how inanimate objects came to life in The Blue Umbrella, unfortunately, they were not all are equally creative and some elements just didn't gel. I felt like this was definitely not up to par with other Pixar Shorts. Fortunately, Monsters University more than made up for the lackluster feeling I had with The Blue Umbrella.